11-11 is here, 1 day only ! By Shopr, created 2015-11-11, last updated 2015-11-11. This year's 11-11 (11th November) shopping festival - what many in China call Singles' Day - is upon us again. Get ready your credit card and prepare to score some great discounts during this unique once-a-year event. The most important thing for this sale is to act fast. 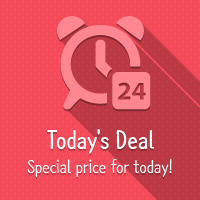 Some discounts last beyond 11-11 but many of the best deals are for one day only. One of the most useful online shopping sites I've found is Ali Express. If you're wondering - yes, this is a subsidiary of AliBaba group. It caters to consumers who are buying a piece or two of listed products for themselves instead of by the container load which Alibaba.com is wellknown for. 1. Browse current sales and items you're keen to get. 2. Save them in your cart / wishlist. 3. Take note of any coupons and special discounts you can apply. Clip the coupons. Bookmark any relevant pages. 4. Repeat steps 1, 2 and 3 for other sites. (read on below for which sites I like to use). reviews of the merchant and the products themselves. Whereas you can compare across multiple sites and even local bricks and mortar stores, chances are you'll get at least a decent deal with reputable merchants with good reviews. So always check and read the reviews. Amazon is my personal benchmark for a great balance of low pricing and quality shopping. In the past I'd regularly use a third party shipper like Singpost(VPost). But Amazon ships a lot of stuff direct to Singapore these days. And the shipping cost can be very low (below USD 10). It's great for buying IT products and gadgets. Remember also the Amazon GlobalSaver Free Shipping programme covers Singapore - if you buy more than USD 125 worth of eligible goods, Amazon ships it to your doorstep for FREE! One of the best discounts you can get now is for mobile phones and IT gadgets like tablets. The plethora of smartphones being produced by China manufacturers nowadays is bewildering. The quality ranges from excellent to mediocre with questionable suitability (you should check the frequency bands) for use in Singapore. I've done the hard work though, and one of the phones I've narrowed down is the Meizu M2 Note. It's a 5.5" Full HD screen phone with all round great specs that will go for US$ 127See note * during this sale. That's below S$200 for a 5.5" Full HD 4G phone that weighs only 149g (compare 170g for the Asus Zenfone 2 and 160g for the Xiaomi Red Note 2) and delivered to your doorstep ! Check it out => here. The seller is one of those specially selected by AliExpress for this 11-11 sale. Reviews for this merchant and Meizu phones have been quite excellent. (If you're worried about warranty, I'll explain more in a future article. Suffice to say for now that for less than S$200, I'm personally willing to go for it! If you prefer a local Singapore based online retalier and generally faster shipping, then Qoo10 is a great bet. The trick is to get discount coupons and look out for any time sales and special promotions. There is a wide range of coupons you can get - shop-specific coupons, cart coupons, credit card coupons and more. Qoo10 – Singapore No 1 shopping site – leading pan Asia online market for fashion, digital, living, cosmetics, food and entertainment.